It resembles the Common Starling in shape and behaviour, but yellow bill is shorter with curved culmen. Adult's black and pink plumage can’t be mistaken. Has a long pointed crest which is raised when singing. 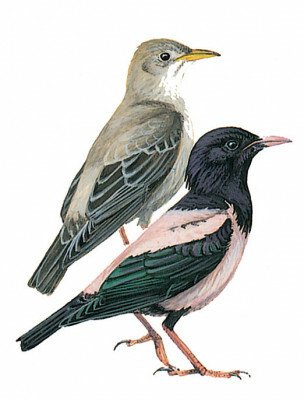 Juvenile has a yellowish bill, pale lores, pale grey-brown upperparts with whitish grey rump and dirty white underparts.